"No person should ever be marginalised or set aside," Bishop Duffy. 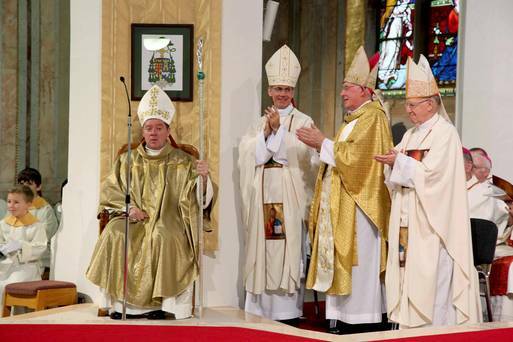 The Irish Church’s newest bishop was ordained Bishop of Ardagh & Clonmacnois at Mass in St Mary’s Pro Cathedral in Athlone on Sunday afternoon. Cardinal Sean Brady, Archbishop of Armagh and Primate of All Ireland, was the principal ordaining bishop at the ceremony which saw 53-year-old Bishop Francis Duffy join the ranks of the Irish episcopacy. The Cardinal was assisted two co-consecrators, the Papal Nuncio, Archbishop Charles Brown, and the retiring Bishop of Ardagh & Clonmacnois, Bishop Colm O’Reilly. In his address following his ordination, Bishop Duffy explained why he had chosen the motto ‘I have come that they may have life’. Noting that Sunday was the day which marked the Church’s annual ‘Day for Life’ and that this year’s theme was ‘Care for Life: It’s Worth It’, he said “This is a pastoral letter to the faithful of Ireland from our bishops. It holds up the vision that no person should ever be marginalised or set aside,” he said. Bishop Duffy said he also shared the country’s shock and revulsion over the alleged attacks on “two innocent children” in Athlone last weekend. “My prayer today is for the young victims, their families and local communities,” he said. As we survey the landscape of our time we can identify with the perception of Pope Emeritus Benedict that ‘the faith in Europe has grown tired’. We could even feel disheartened by the sense of ‘untroubled irreligion’ and increasing ‘ecclesiastical emigration’ that surrounds us, by the awareness of the throngs who no longer walk with us, who claim to believe but not belong. The voyage of faith is, and has always been a search rather than an arrival, a trust rather than a certainty, a search to discover the print of His hand in the people, places, smiles, tears of those encountered on the road. Many reasons can be advanced for the weakening of the light of faith in this generation, but somewhere in the mists of recent times we have failed to tell the story, our story, which is the story of Emmanuel, God in the midst of His people, the story of the marvellous, the greatest story ever told, and when our story gets lost other less worthy stories take its place. It is the urgent task of the keepers of the flame to tell the story anew, because, beneath the veneer of ‘untroubled irreligion’ there lies a deep yearning for meaning, he said.